Well, that’s a wrap for Bendis at Marvel.. at least I think?!?! I think this was the last issue of his ongoings at Marvel before he starts up at DC. The issue had its quirks but as a whole, did a pretty good job closing everything up and giving everyone some great cliffhangers if anyone wanted to follow in his footsteps after this. The story kind of jumps all over the place so it may be better to pick a topic and explain that first before moving on to the next topic. So, I’ll start with Tony Stark bringing Rhodey back to life the same way he brought himself back to life: with biotech, genius, and no hair. Somehow, which isn’t totally explained, the use of the armor, the tech, and the upgrades to both the tech and their biochemistry made it possible to somehow reboot both of their organic material as well. BUT, to my understanding, this is a one-time thing. 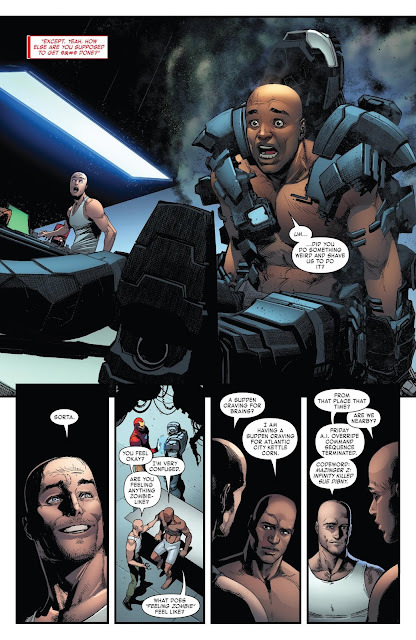 So, Rhodey and Tony are back for reals yo! 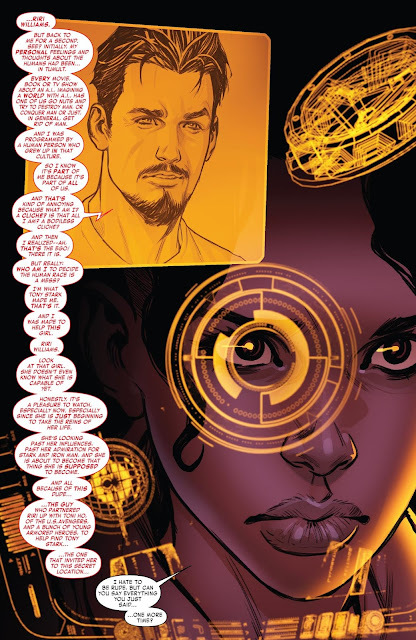 At the end of the last issue, RiRi and Toni Ho flew up to the great helicarrier in the sky to find that Leonardo Divinci was still alive and created SHIELD way back in the day. SHIELD has been around since the late 1400’s as an organization of spies to basically make the world a better place. As technology grew, so did SHIELD. When heroes came on the scene, as well as more evolved tech, SHIELD evolved with it. But with the destruction of SHIELD, Leonardo Divinci stepped back in to reconstitute the organization all over again. RiRi and Toni Ho were recruited along with Arno Stark, Miles Morales and family, Blade, and possibly the Champions to a degree, and maybe Rhodey and Tony... but I’m not sure on that one. Either way, SHIELD is kind of back! And next, we jump to The Hood, Parker Robins, whose possessed by a mystical demon named Nisanti. His goal was to take over the world by taking over Stark International and spreading through the globe along with all of Tony’s enemies. He compared his take over to Fisk and how he took over the underworld of NYC except his would be on a more worldwide scale. But, as the Hood was forcing the acting Chair of Stark International to sign over the company, Doctor Doom appears to put the kibosh on his plans along with a dozen or so Doombots. Tony and Rhodey also show up on the scene with some extra Iron Man Suits also putting the kibosh to the Hood’s plans. Tony seems confused that Doom was acting as him and Doom is confused that Tony is still alive. Either way, they both stop the Hood and Doom ends up going back to Latveria to rebuild. We still aren’t told why Victor was acting like Iron Man but we are left remembering he has an unborn son on the way. I personally love Doom and I‘m totally interested in that dangling carrot for the future. And we almost end with Tony and Rhodey flying back to Stark Tower where they find Tony’s real mother, who was a secret agent for SHIELD and a real Rockstar, trying to fight off Tony’s actual biological father, who happened to be a Hydra secret agent. Howard Stark adopted Tony to help hide him from SHIELD and Howard needed help hiding his own son Arno from space aliens (an old story for another time) so it was a win-win. 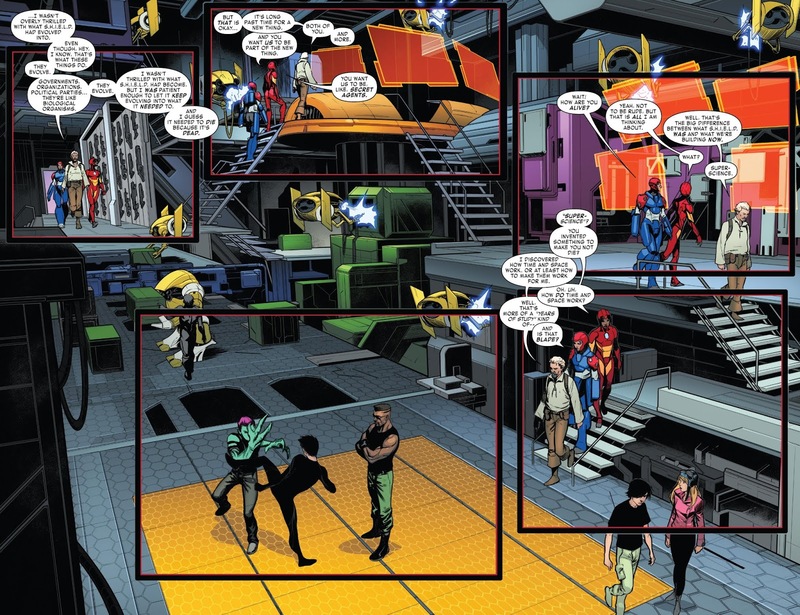 Anyway, Tony’s bio-dad brought Hydra agents to the party so the Champions, Tony, Rhodey, RiRi, Toni Ho, Arno, Blade, Miles-Spidey, Leonardo Divinci in a flying suit of armor ( yup that one), and even MJ, who was running Stark International, help fend off Hydra. Tony shows everyone he’s back and alive. 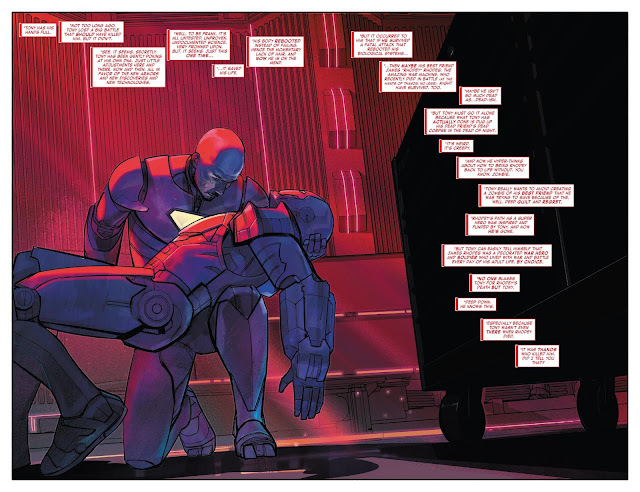 We kind of wrap everything up and put a nice bow on Bendis’ run but he decided to leave an awesome cliffhanger for the next creative team to run with if they wanted. We jump into the future to see some girl contact Nightcrawler in need of help from the Sorcerer Supreme. She asks for Dr. Strange. But when he appears, he says “ now that’s a name I haven’t heard in a long time. My name is Doctor Anthony Stark... and I am the Sorcerer Supreme.” I WANT TO SEE THAT STORY! 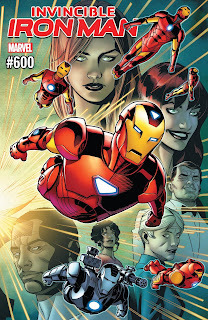 Well, as you can see that was a packed 40-page issue 600 that wrapped up Bendis on Iron Man as well as many of his other titles. The issue was meaty, to say the least but did a pretty good job of concluding as many loose ends as it could. I also feel like it left great starting points for the next creative team if they wanted to run with it. However, like most people to start a new job, they will probably want to take the book in their own direction. I don’t blame them for that. Personally, I want to learn more about Doom and his kid. I want to learn more about SHIELD and Leonardo Divinci. I really want to see this future scenario with Tony as the Sorcerer Supreme. There are so many good loose threads that I hope the next creative team pulls on but we shall see. This issue was mainly there to put closure to all that Bendis did in a variety of titles mixed together including Miles, RiRi, Doom, Tony, some of the SHIELD stuff, and so much more. It was a pretty good culmination to anyone that was a diehard Bendis fan that really didn’t want to see him go. I can also only imagine how hard this issue must have been for Bendis to write. I know he’s excited to move on to new ideas and adventures in DC but Bendis did so much at Marvel for so long. The memories and family he made they shined through on this issue. Sure, it had its dumb little jokes that made no sense like “Mazinger Z infinity killed Sue Dibny” which I have no idea how that is a code phrase or how some Japanese mech tv show killed Elongated Man’s wife... but overall, I could read an underlining tone of sadness throughout the writing. To be honest, there should be if he truly cared about the characters he created... and I think he did. Thank you for a good run Bendis. Thank you for these characters you created. I wish you good luck at DC and I really am excited for what’s to come there. If you are a Bendis fan, you got to pick this up. If you are a collector, it’s issue 600 and it’s oversized so go grab it. 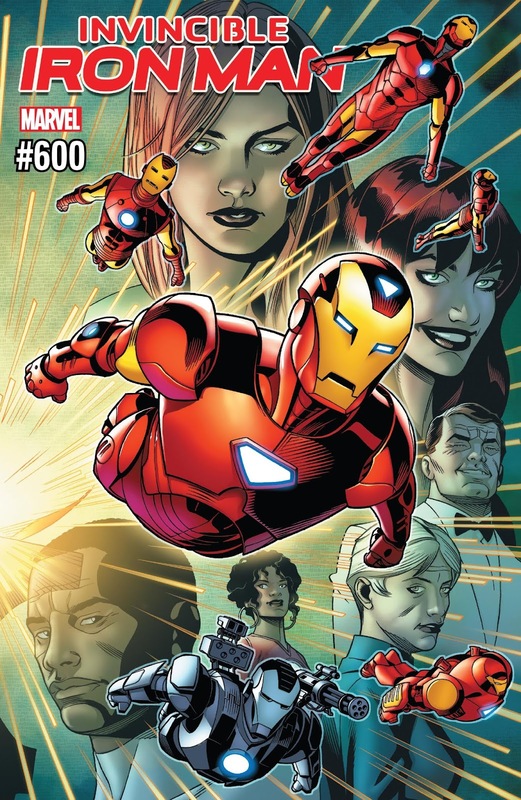 If your an Iron Man fan, you should grab this too. And of course, if you’ve been following along, it would be silly not to grab this too. It was a fun issue with great action, great art, great closure, and left us with a great direction for the next creative team. The baton is passed. Let’s see what happens next!